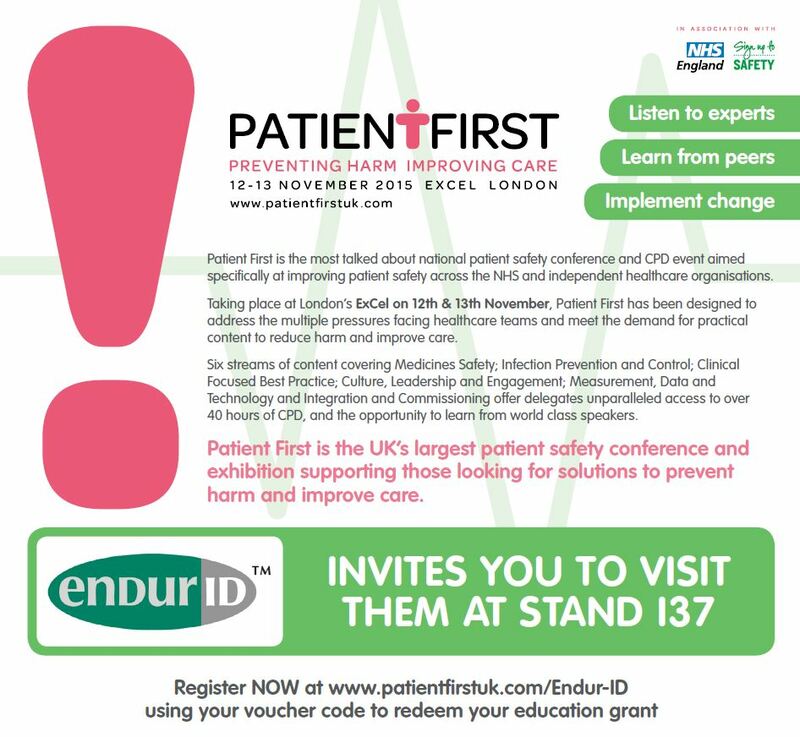 Endur ID, a company that is known for producing bar coded wrist bands that are used in hospital, correctional facilities and behavioral health facilities, will be attending the Patient First UK Conference on 12th and 13th of November 2015 to showcase its range of bar coded wristband products. Endur ID was founded in 2003 with the purpose of improving patient identification systems by means of digitized hospital wrist bands. Each of the available options are easy to print and use, comfortable for patients to wear and can be produced within a matter of minutes by means of standard laser printers. In addition, the company is known for implementing the Color Coding Standards System on these wrist bands that help identify patients who have serious allergies, are at risk of falling and who fall into the Do Not Resuscitate (DNR) category. These wrist bands are printed on plastic, ensuring that they are waterproof, tear-resistant and extremely clear to read. This conference aims to bring together a group of medical doctors, directors, nursing directors and nursing employees, infection prevention and control specialists, patient safety employees, senior operational staff, pharmacists and numerous other medical professionals from round the UK to learn new information from keynote speakers and exhibitors who will be present. The event took place for the first time in 2014 and this year’s promises to be bigger and better in that better theaters will be available, networking opportunities will be better and access to a show floor tech hub will be made available as well. This year, there will be an extensive range of keynote speakers at the conference, making it more worthwhile than ever for all medical professionals to attend. Some of the more well-known speakers who will be in attendance include Dr. Ron Daniels (CEO, UK Sepsis Trust), Professor Louise Appleby (Professor of Psychiatry at the University of Manchester), Dr. Honey Thomas (Consultant cardiologist, Northumbria Healthcare NHS Foundation Trust), David Wood (Associate Director of Safe Services, Cheshire and Wirral NHS Trust), Dave Tucker (Deputy Director of Infection Prevention and Control, Guy’s and St. Thomas’ NHS Foundation Trust) and many more. Delegates who would like to attend this conference will need to register beforehand to ensure availability of places. Registration can take place on either day of the event; however, this will be subject to availability of places. Registration is £399 + VAT per delegate and the conference will run from 8:30AM to 6:00PM on both days and in some cases, underwriting or sponsorship may be available for delegates who cannot afford to cover the cost of attending the event. With the amount of exhibitors that will be present at this years’ Patient First UK Conference, all of the medical professionals who will be attending can be certain that they will learn something new and exciting pertaining to products and services that help promote patient safety.